This “Lumaconi” pasta dish is one of the nicest meal I’ve ever eaten. 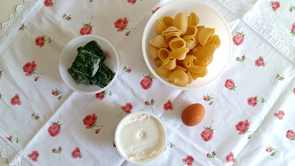 It is a traditional dish in Italy, but at the same time and even though it is a pasta dish it is very different from a typical pasta recipe. 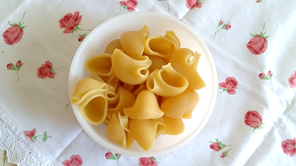 “Lumaconi” is a type of pasta with a peculiar shape. 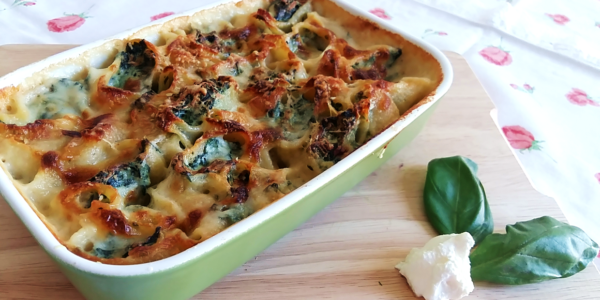 It is perfect to embrace a cheese and vegetable filling! These ingredients combined together in a vibrant chorus to please even the most finicky gourmand. Delicious both warm and cold. Easy enough for a weeknight meal or for a lovely Sunday dinner. 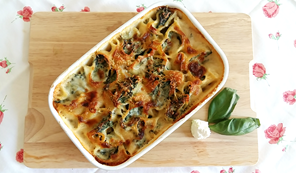 Everyone loves cheesy Italian food, so let this become the favourite meal of your guests.. you will be repeatedly asked to cook it again and again! 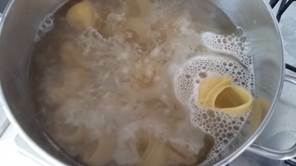 Bring a pot full of salted water to the boil and cook the pasta for around 3-4 minutes less than the time suggested on the pack. Drain the pasta and let it cool down. 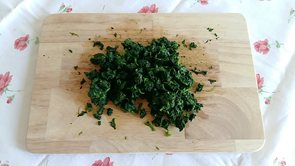 In the meanwhile, defrost the spinach, squeeze them and mince them finely. 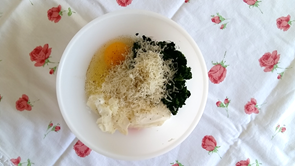 In a bowl, add the ricotta cheese, egg, grated Parmesan, and the minced spinach. Season with salt and nutmeg. Stir all together and obtain a lovely mixture like this one. 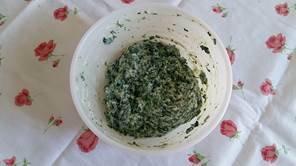 Fill a pastry bag with the ricotta and spinach mixture. 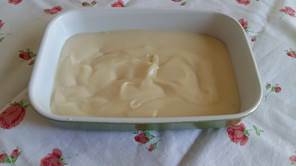 Pour the white sauce in a baking tin. 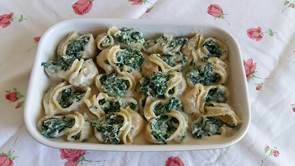 Fill the Lumaconi with the mixture and place them in the tin. 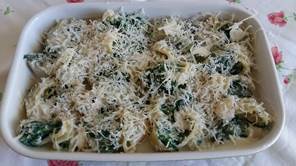 Sprinkle with grated Parmesan and butter curls. Cover with aluminium foil and bake at 200°C for 40 minutes. Serve hot… already done! Enjoy and.. Buon Appetito!